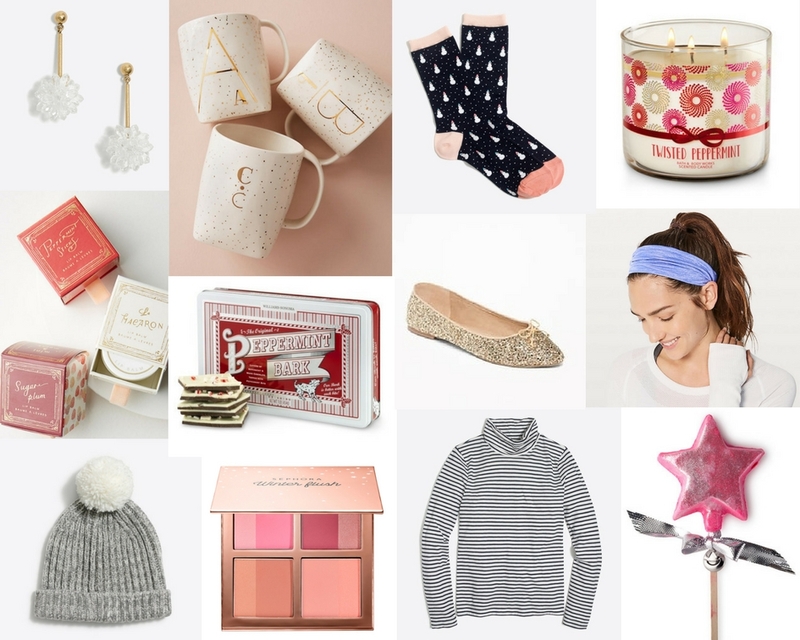 Gifts Under $25 for Her. 1.) J. Crew Earrings: for the glam gal. 2.) Monogram Mug: for the coffee or tea gal. 3.) Fun Socks: for the cozy gal. 4.) Bath & Body Works Candle: for the basic gal. 5.) Lip Balm: for the gal who has everything already. 6.) Peppermint Bark: for the sweet gal. 7.) Glittery Flats: for the glitter gal. 8.) Lululemon Headband: for the sporty gal. 9.) Pompom Beanie: for the gal who is always cold. 10.) Blush Palette: for the makeup gal. 11.) Striped Turtleneck: for the gal who loves stripes. 12.) Lush Bubble Bar: for the gal who needs to take a bath and relax.